If you need closet organizers for your home in Oklahoma City, OK, you can count on 31-W Insulation to get the job done right. We’ve been providing home remodeling services since 1972 and have dedicated the last 40-plus years to perfecting our craft. You can rest assured that we’ll not only install your new closet systems with the utmost attention to detail, but that we’ll provide the high level of customer care your family deserves. 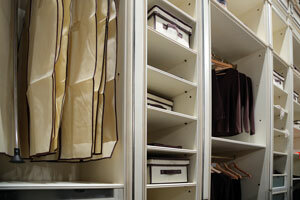 What’s more, you can be confident that we’ll construct your closet organizers using only the finest materials available. To this end, we’ll design your system using components from ClosetMaid, one of the most trusted names in home organization. ClosetMaid has perfected the art of manufacturing shelving components that resist wear and tear to stand the test of time. Plus, ClosetMaid’s closet systems are made from wood/laminate or wire and come in a wide assortment of colors and finishes. This means that your closet organizers will beautifully complement your home’s décor while they help your household stay tidy. If you’d like more information about the closet organizers that we install in Oklahoma City, OK, and surrounding communities, feel free to contact us and schedule a complimentary consultation.